There are as many ways to define Artist Books as there are people (artists, curators, collectors, critics, librarians, lovers of art…) involved in the Artist Book phenomenon. Rules — there are probably a lot fewer rules than there are definitions because frankly, my dear, the artists don’t give a damn. 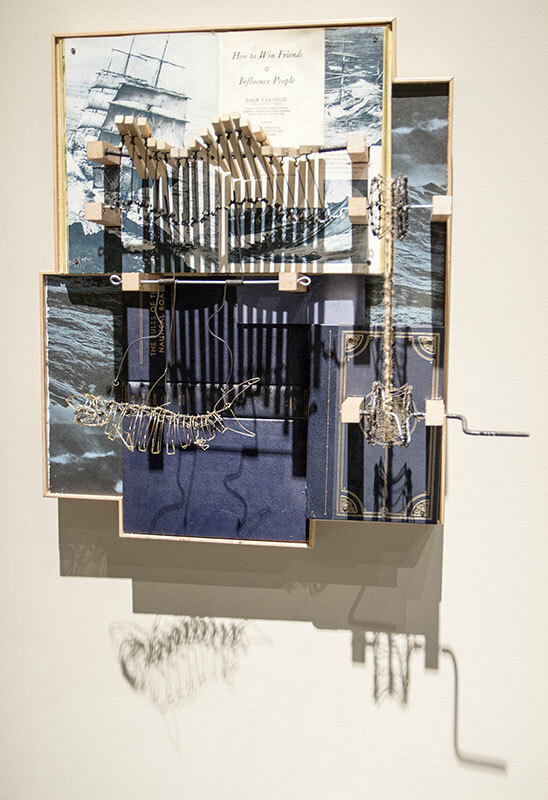 Sandra Kroupa, Book Arts & Rare Book Curator at the University of Washington, said in her lecture — “Breaking Boundaries: the Hand as the Cutting Edge of the Mind” — that she refuses to define “Artist Books”. Smart lady. 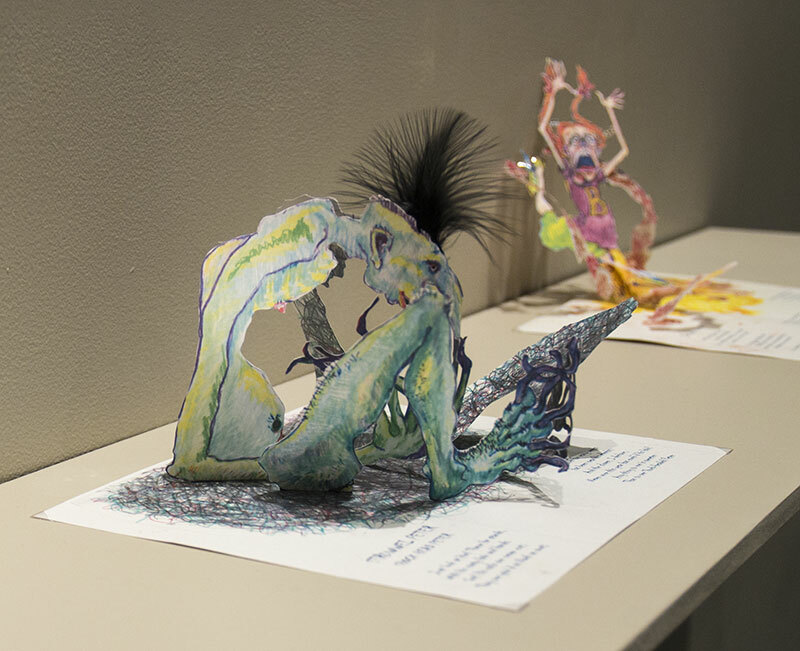 The current show at the Whatcom Museum “Unhinged, Book Art on the Cutting Edge” is a curatorial effort to demonstrate the wide variety of approaches to making Artist Books. Now one good thing about this show is that it is in a museum, giving gravitas and credibility to a movement little understood in current culture. A bad thing about this show is that it is in a museum, with most of its items under vitrines. Only one of the offerings was touchable. And as Sandra pointed out, most Artist Books are to be interacted with, touched, manipulated in some way. To grasp the meaning of Casey’s book, it is essential to turn the crank to activate the waves and the swimming shark. I love Casey’s wry commentary on our current world: “It’s a big ocean out there, and we should all learn how to play nicely with each other.” All this overlaid on books on ship protocol and “How to Win Friends and Influence People”. If you click on the names in the captions, you will be taken to pages that show more of these remarkable works. If you click on the pictures, you will get enlargements. Sun Young Kang’s book/installation begins in the personal — the death of her father. In what becomes a ritual floating in timeless light and shadow, she uses incense to burn the Korean text (Until we meet again, I will be trying to find the one way) into 1080 small pieces of Okawara paper. Islam Aly’s work begins in the public and the political, the uprising in Cairo’s Tahrir Square in 2011. Arabic Kufic script (The People Want to Bring down the Regime) is laser cut into each page and it has a burned look. There are many more parallels and telling differences. But take just one metaphor common to both — burning. It speaks to the intensity of the underlying emotions in each case. Additionally, in the conversation of the two books we come to hear the individual in the throng that brought down a tyrant, and we consider the universal loss of a parent. In other words, the two books reinforce each other and lead the viewer to new considerations. Book artists use a variety of approaches. 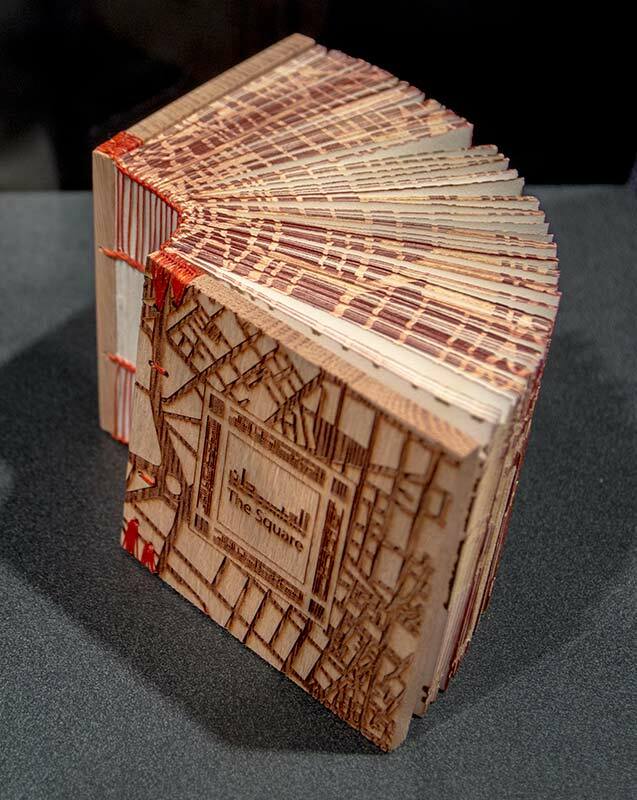 The most common undertakings are constructing a book and altering or repurposing a book. But some artists like to just redefine bookness. 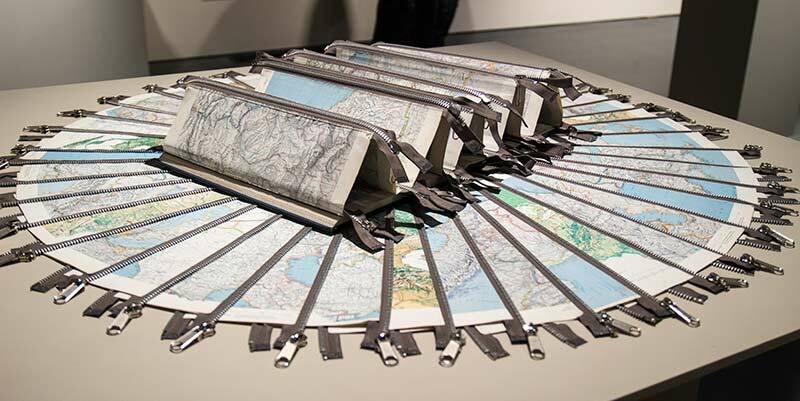 In “Border Crossing: in the War Room” Doug Beube has taken pages from an atlas and sewn zippers on them. Presumably one can adjust the book to many formations. Further, it is a visual commentary on territorial borders and leads one to thoughts of our current immigration woes. While Doug is creating his “versatile codex” Susan Porteus is doing something completely else. Susan has taken spinning as the main metaphor in the life and teachings of Gandhi. 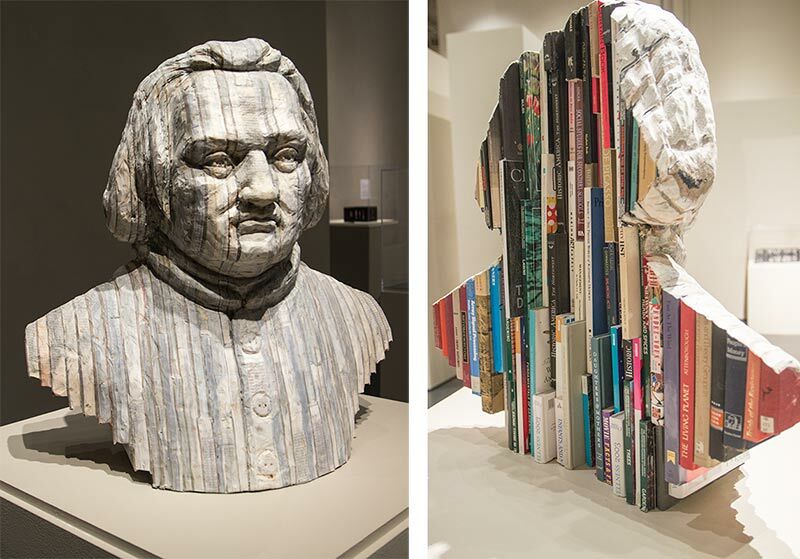 Repurposing books about him she has spun their pages into new artist books giving specific form to his work and meditation. 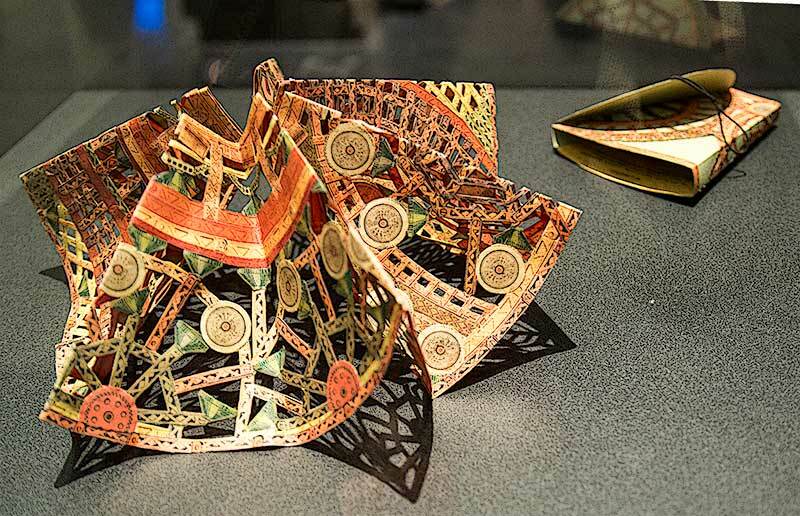 Donald Glaister uses a fairly traditional codex form here, but the pages are made of aluminum which gives a special sheen that makes his subject matter sing. It is visual poetry. This piece is remarkable for its monumental quality. My first thoughts went to memories of the marble head of Constantine the Great. Or Mount Rushmore. “Liszt” is not that big, but he gives one pause. She calls it “an elegy for the mountains”. This book is especially disturbing when you see it lie flat and mimic the ravaged earth. There is not much more of value that one could say. 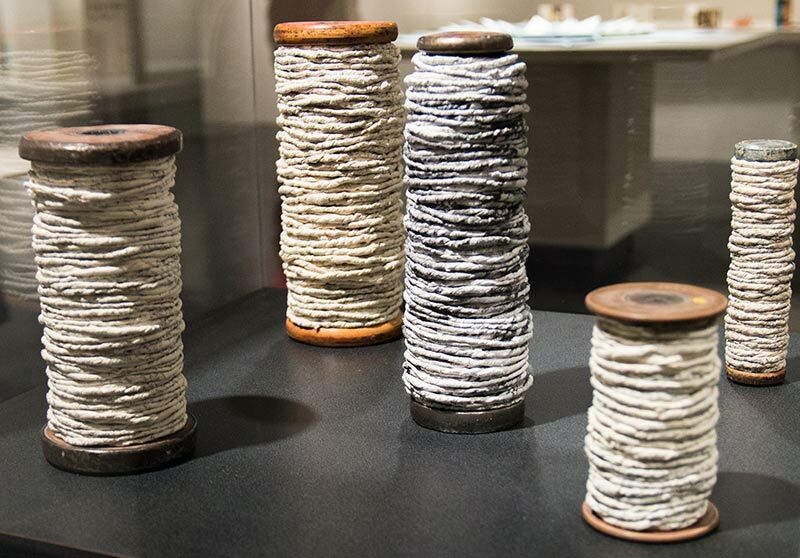 Lest the show get too ponderous, the curators included Deborah Greenwood’s gentle memory of childhood toys and a call to relax and re-create oneself. 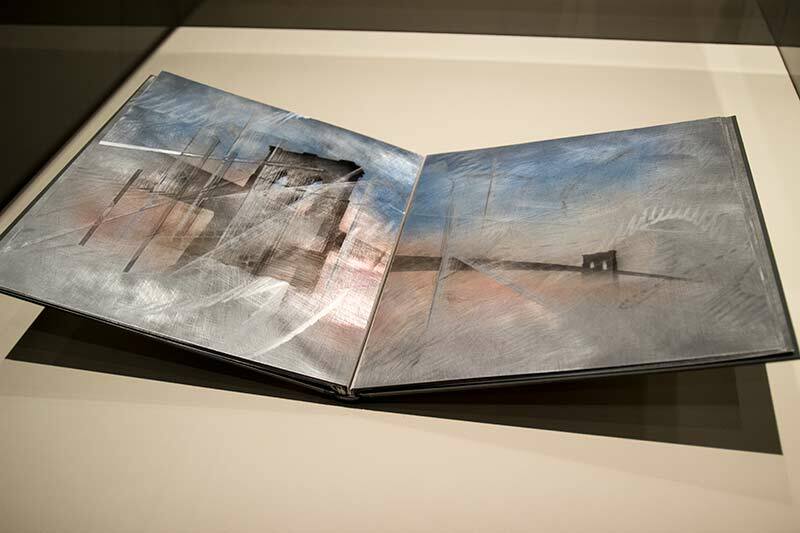 To my mind, an Artist Book needs to surprise the viewer. Indeed, one of the qualities I wanted to see more of in this show is a sense of fun and humor. I was delighted to see a work by Lisa Kokin, masterful observer of ludicrous humanity. “Fret” is from her self-help books series. 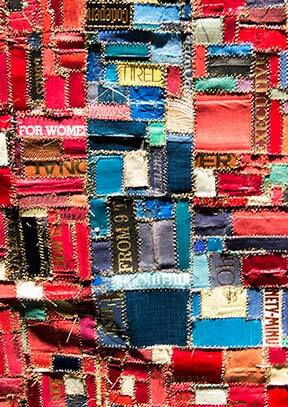 It involves book spines sewn into an eye dazzling but comforting quilt. It is sly humor and double meaning, and a stretching of the bookbinding metaphor. Both beautiful and surprising, it is an object to contemplate and enjoy. Circling back around to the idea of books talking to each other. 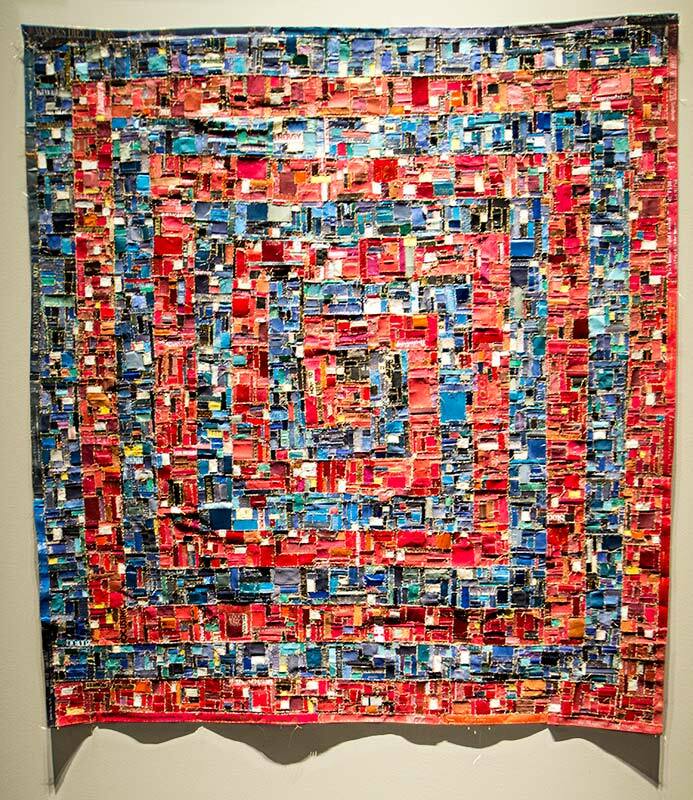 There is another “quilt” in the show. Each of the “Coverlet’s” quilt rectangles is made of crumpled pages from Fragments d’un discours amoureaux by Roland Barthes. Claire’s book evoked my childhood memories of making “leather” by distressing brown grocery bags. That is the technique she has used to make the coverlet look and feel like flannel. What is the conversation about between these two quilts? Maybe it’s for us to lend an ear. I’m always skeptical of the words “cutting edge”. I feel that if you can see the cutting edge you are viewing it from behind. It has already passed you by. But I like the double meaning of “the hand as the cutting edge of the mind”. 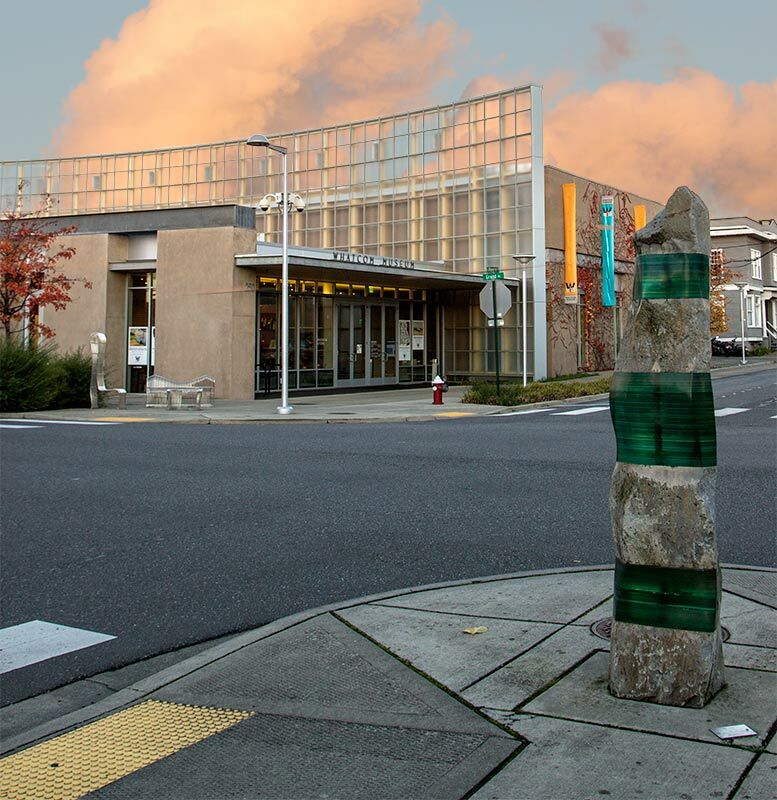 In any case, the artist book makers are giving us a new venue for visual thought. The museum is metaphorically on fire. There is much to mull. It is time to travel home. 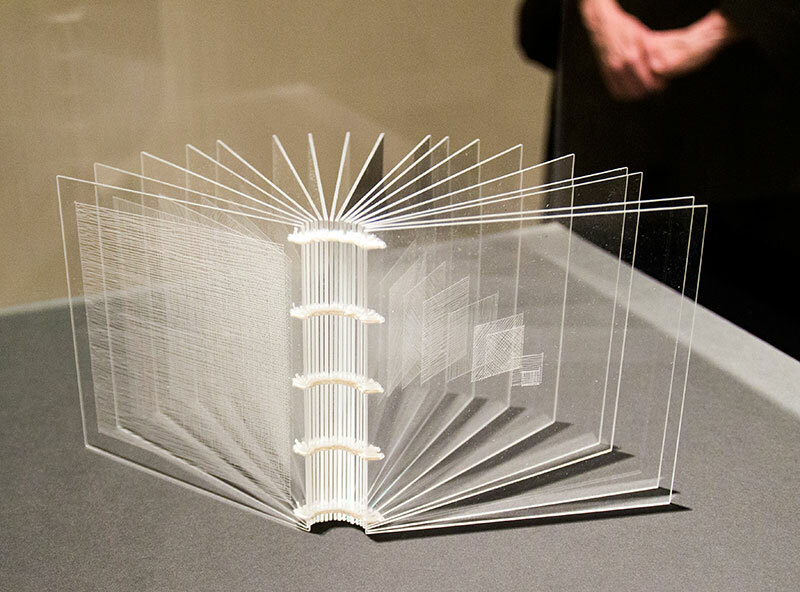 There are 70 spectacular pieces in this show by 61 artists, including most Artist Book luminaries, from around the world. There was time and space to mention only a few of them in this post. If you are at all interested in the making of meaning I highly recommend this show. Every Thursday is $5 admission!